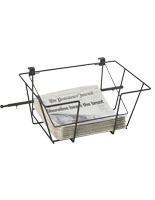 This poster display stand holds your 24" x 36" prints! Easily load/unload posters with no tools! Accomodate your larger sized 24" x 36" prints. 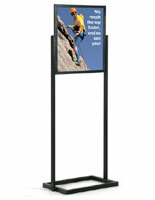 This poster display stand features an easy to load and unload system. No tools are necessary. 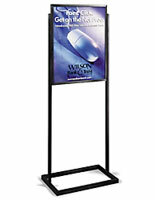 Display your 24" x 36" posters back-to-back against the provided middle support panel. 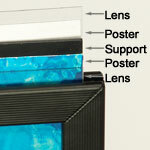 Use the two non-glare lenses to protect the images then slide the posters, lenses and support panel into the metal grooves of the display. 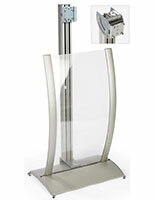 This poster display stand requires minor assembly consisting of securing the base to the body. 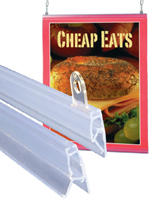 Displays2go supplies the poster display stand with the (2) phillips head screws needed for assembly. 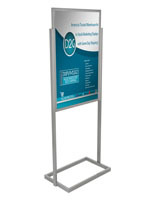 This poster display stand is one of our most popular designs now offered in a 24" x 36" size. The product seems to be good quality. I was in a hurry to purchase a sign and went with the first thing I found that matched what I was looking for. $137 seemed steep, especially when adding the $55 for shipping - (Yikes)! But the sign stands up correctly and holds my posters in the most distinguishable manner. Kathleen, thank you for taking the time to write this review! We appreciate your feedback very much, and we're glad that you found this poster stand to be such a high-quality and professional solution. 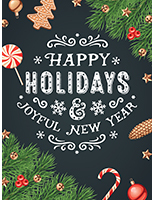 We're always working to reduce our shipping costs and offer the most competitive pricing, and we'll certainly send your feedback along to our team for review. Thanks again! Very pleased with the product. 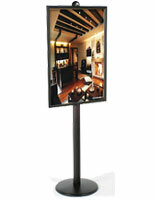 It is exactly what we need as it is so versatile (mobile, easy to change poster, sturdy) and eliminates putting another hole in the wall.